It has become crystal clear to me recently that at least a few boys in my class have some significant issues with female authority figures in a way that they don’t with male authority figures. There are lots of reasons this is true, many of them systemic within our society. As we head into the last five or so weeks of our year together this is something I’ll be thinking about a lot. It was easy for me to ignore and deny because (mostly) they didn’t have issues with me. But we’ve spent the year together, building relationships, coming to trust and respect one another. The issue has been highlighted when it comes to women in other roles in our school. Women they see far less frequently than they do me. So I need to think about what this means for the rest of our time together. Luckily, we finished a book last Wednesday and were ready to begin a new one. I had already realized we had read far more fiction than nonfiction and that this next, possibly last, book needed to be nonfiction. I also haven’t been thrilled with the diversity in my read alouds and felt that I could do better in that area. So I chose Rad Women Worldwide for our next title. We began the book on Thursday, discussing our expectations for it based on the cover and title. I showed them the endpages with the world map and spots for each of the women in the book. We read the introduction and first two biographies (Enheduanna and Malala Yousfazai). As we’ve read and discussed Malala before, that pulled in anyone who was still hesitant. 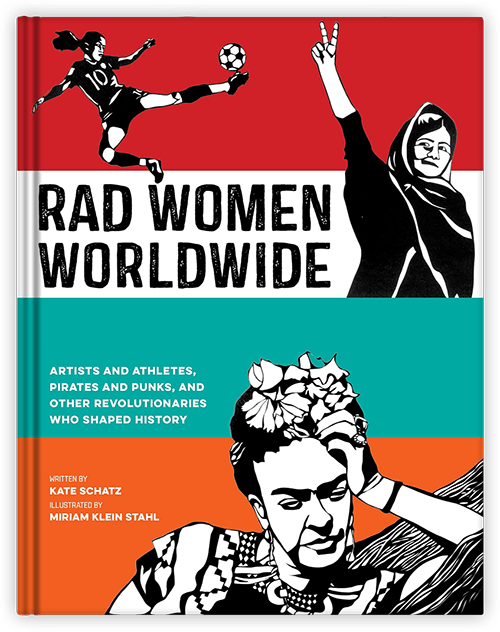 At the end of that day’s reading I told the students that this author, Kate Schatz, has also written a book called Rad American Women, A-Z. I told them if they were interested that I have the book and would be happy for them to read it. The history of the world is vast, amazing, and fascinating. But so often the stories we hear and lessons we learn focus on the contributions and actions of men. We didn’t dig deep with those sentences on Thursday. But we’ll clearly return to them. Third graders are just beginning to look more critically at the world around them rather than accept it all at face value. Those two sentences and the rest of this book will help us ask some important questions and, hopefully, think deeply about our own ideas and values. This is an uphill battle as there are plenty of messages in books, on television, in newspapers and magazines, on the radio, in music, etc., etc., etc. that feed sexism. But the sooner we can begin to look critically at those messages and the media we consume and look critically at what it makes us feel and think, the better.